1. The 55-65 Year age bracket is now the fastest growing demographic on Twitter. Social media has recently taken on a higher age bracket, which means that the social media platforms are no longer just for teenagers. If the time was ever a time to create a solid marketing strategy, it is now. Since, 2012 the 55-65 year age bracket has grown 79%. On Facebook and Google+ the 45-54 year age bracket is the fastest growing demographic. The 45-54 year age bracket has jumped 46% on Facebook and 56% on Google. Ecommerce store owners can capitalize on these statistics by keeping older users in mind while creating Facebook, Twitter, and Google+ marketing strategies. Millions of social media users don’t use a computer to check their Facebook, so they access it via a mobile device. In fact, 30% of Facebook’s ad revenue comes from mobile. This number has increased 7% since last year, which means that there will be even more mobile Facebook users in coming year. Keep in mind the smaller screens on mobile devices when posting on social media and ensure that your ecommerce store mobile optimized. In addition, make sure that the content on your website is straightforward and easy to share on social media via mobile. 3. YouTube reaches more U.S. adults aged 18-34 than any cable network. If you thought that TV was the best way to reach your target audience, you may want to think again. If your target market is 18-34 year olds, then the best way to reach them is actually YouTube. While one video may not get as many views as a TV commercial, several YouTube videos can gain more traction with the masses. Now is a great time to start implementing video into your social strategy. Look for places on your website that could be easily explained in a 2-3 minute video. Start doing video blogs, product videos, or even just do a 5-minute video explanation of what your company does. 4. LinkedIn is one of the fastest growing social networks for professionals. LinkedIn is rapidly growing its members every second. The platform has a host of blogs, job listings, and conversations that can be a huge source of information for ecommerce store owners. It is worth paying attention to in order to focus on acquiring new customers. A group or a community can be a great source of valuable information about consumers your industry. 5. Social media is now the most common thing people do online. Social media is obviously not just a fad or something to overlook. Rather it is increasingly becoming more and more important for businesses to integrate it into their marketing strategies. New platforms will surely develop, and it is vital for businesses to keep up with new developments in the social media world. 6. LinkedIn has a lower percentage of active users than Pinterest, Google+, Twitter, and Facebook. Although LinkedIn is one of the fastest growing platforms, it has less participating and active users than Pinterest, Facebook, Twitter, or Google+. While plenty of consumers are members, few are actually participating. This fact influences how businesses should post participatory content on LinkedIn. If you want to get people involved, use Twitter or Facebook, as these platforms conduct a better playing ground. Whereas, LinkedIn is more suited for posting passive content, like blogs or press releases. 7. 93% of marketers use social media for business. Social Media is no longer an after-thought; it is a necessity. 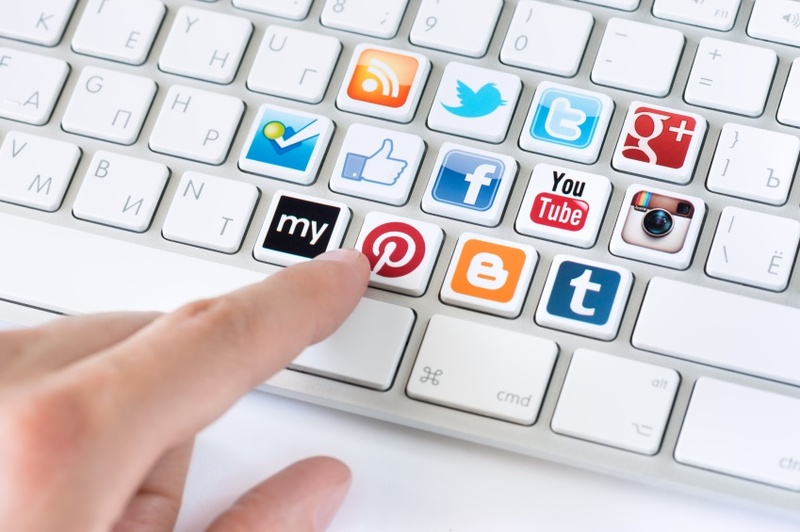 What this means for ecommerce businesses is that using social media is becoming more and more common for marketing. 90% of people trust online recommendations from people they know. Online retailers can encourage satisfied customers to recommend their products to their friends by clicking the “Share” button. Knowing that you are not alone in the social media marketing game can help you to leverage all that knowledge to your advantage. If 93% of marketers are using social media, then someone will surely give you a hand. 8. 25% of smartphone users ages 18-44 say they can’t recall the last time their smartphone wasn’t next to them. As you already know, mobile is the future of ecommerce, however, mobile is also the present. If your business isn’t paying attention to mobile yet, it is time to jump on the bandwagon. Smartphones are attached to consumers’ hips, which means that you have the ability to reach them anywhere they go, anytime of the day. Although this means that you can interrupt them at pretty much any time of day, they also may not be as engaged at certain times of the day. Twitter engagement for brands is 17% higher on weekends. Only 19% of brands tweet on the weekends. Click through rates are higher on the weekends, yet very few brands tweet at this time. Try it out and see if you can reach a new consumer base without interfering with their workweek. 9. 62% of marketers blog or plan to blog in 2013, but only 9% of US marketing companies employ a full-time blogger. Blogs and content creation is clearly a big focus for marketers for several reasons. Blogs can be used to set the tone of your company, market your products, share company news, provide information for your customers, increase your search engine rankings, and much more. However, then need for consistent, quality content will be higher than ever in coming years with less and less companies employing full-time bloggers. Having a content strategy means that you will need to consistently post on your blog. If you don’t have a full-time blogger than you can have different members of your team contribute to content creation. However, keep in mind that it is more difficult to keep a consistent content strategy with several content creators. 10. 25% of Facebook users don’t change their privacy settings. Facebook has a history of making tech news with its privacy issues. With the recent NSA news and the Instagram terms of service change. However, it turns out that a quarter of all consumers on Facebook aren’t even worried about changing their privacy settings. Remember that your consumers are more human than tech news makes them out to be. Each consumer is different and has changing tastes and preferences. Adjust your marketing strategies accordingly.